Understanding the characteristics or affordances of each medium or technology that influence its usefulness for education will help clarify our thinking of the possible benefits or weaknesses of each medium or technology. This will also allow us to see where technologies have common or different features. We shall see that these characteristics are more dimensional than discrete states, and media or technologies will fit at different points on these dimensions, depending on the way they are designed or used. 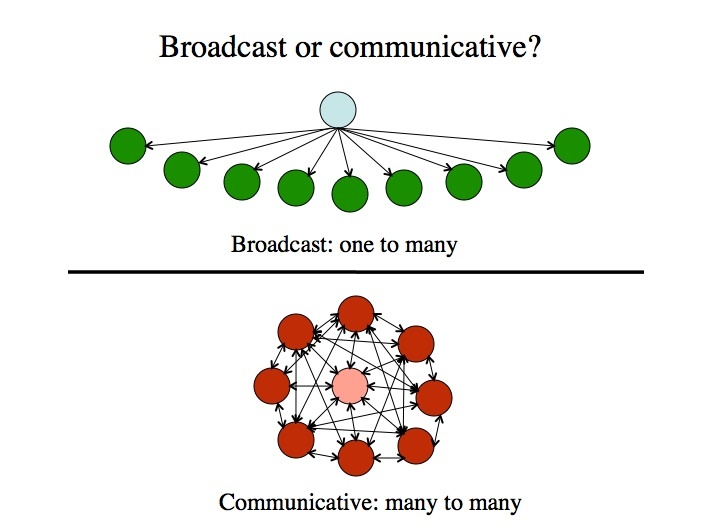 A major structural distinction is between ‘broadcast’ media that are primarily one-to-many and one-way, and those media that are primarily many-to-many or ‘communicative’, allowing for two-way or multiple communication connections. Communicative media include those that give equal ‘power’ of communication between multiple end users. Television, radio and print for example are primarily broadcast or one-way media, as end users or ‘recipients’ cannot change the ‘message’ (although they may interpret it differently or choose to ignore it). Note that it does not matter really what delivery technology (terrestrial broadcast, satellite, cable, DVD, Internet) is used for television, it remains a ‘broadcast’ or one-way medium. Some Internet technologies are also primarily one way. For instance, an institutional web site is primarily a one-way technology. One advantage of broadcast media and technologies is that they ensure a common standard of learning materials for all students. This is particularly important in countries where teachers are poorly qualified or of variable quality. Also one-way broadcast media enable the organization to control and manage the information that is being transmitted, ensuring quality control over content. Broadcasting media and technologies are more likely to be favoured by those with an ‘objectivist’ approach to teaching and learning, since the ‘correct’ knowledge can be transmitted to everyone receiving the instruction. One disadvantage is that additional resources are needed to provide interaction with teachers or other learners. The telephone, video-conferencing, e-mail, online discussion forums, most social media and the Internet are examples of communicative media or technologies, in that all users can communicate and interact with each other, and in theory at least have equal power in technology terms. The educational significance of communicative media is that they allow for interaction between learners and teachers, and perhaps even more significantly, between a learner and other learners, without the participants needing to be present in the same place. This dimension is not a rigid one, with necessarily clear or unambiguous classifications. Increasingly, technologies are becoming more complex, and able to serve a wide range of functions. In particular the Internet is not so much a single medium as an integrating framework for many different media and technologies with different and often opposite characteristics. Furthermore, most technologies are somewhat flexible in that they can be used in different ways. However, if we stretch a technology too far, for instance trying to make a broadcast medium such as an xMOOC also more communicative, stresses are likely to occur. So I find the dimension still useful, so long as we are not dogmatic about the characteristics of individual media or technologies. This means though looking at each case separately. Thus I see a learning management system as primarily a broadcast or one-way technology, although it has features such as discussion forums that allow for some forms of multi-way communication. However, it could be argued that the communication functions in an LMS require additional technologies, such as a discussion forum, that just happen to be plugged in to or embedded within the LMS, which is primarily a database with a cool interface. We shall see that in practice we often have to combine technologies if we want the full range of functions required in education, and this adds cost and complexity. Web sites can vary on where they are placed on this dimension, depending on their design. For instance, an airline web site, while under the full control of the company, has interactive features that allow you to find flights, book flights, reserve seats, and hence, while you may not be able to ‘communicate’ or change the site, you can at least interact with it and to some extent personalize it. However, you cannot change the page showing the choice of flights. This is why I prefer to talk about dimensions. An airline web site that allows end user interaction is less of a broadcast medium. However it is not a ‘pure’ communicative medium either. The power is not equal between the airline and the customer, because the airline controls the site. It should be noted too that some social media (e.g. YouTube and blogs) are also more of a broadcast than a communicative medium, whereas other social media use mainly communicative technologies with some broadcast features (for example, personal information on a Facebook page). A wiki is clearly more of a ‘communicative’ medium. Again though it needs to be emphasized that intentional intervention by teachers, designers or users of a technology can influence where on the dimension some technologies will be, although there comes a point where the characteristic is so strong that it is difficult to change significantly without introducing other technologies. The role of the teacher or instructor also tends to be very different when using broadcast or communicative media. In broadcast media, the role of the teacher is central, in that content is chosen and often delivered by the instructor. xMOOCs are an excellent example. 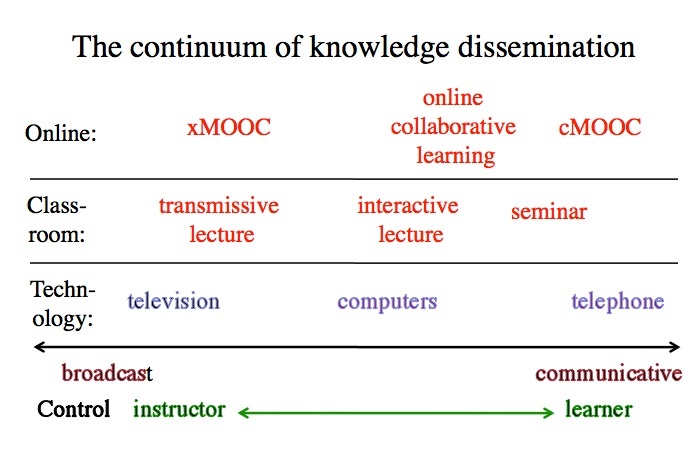 However, in communicative media, while the instructor’s role may still be central, as in online collaborative learning or seminars, there are learning contexts where there may be no identified ‘central’ teacher, with contributions coming from all or many members of the community, as in communities of practice or cMOOCs. Thus it can be seen that ‘power’ is an important aspect of this dimension. What ‘power’ does the end-user or student have in controlling a particular medium or technology? If we look at this from an historical perspective, we have seen a great expansion of technologies in recent years that give increasing power to the end user. The move towards more communicative media and away from broadcast media then has profound implications for education (as for society at large). We can also apply this analysis to non-technological means of communication, or ‘media’, such as classroom teaching. Lectures have broadcast characteristics, whereas a small seminar group has communicative characteristics. In Figure 6.4.3, I have placed some common technologies, classroom media and online media along the broadcast/communicative continuum. the continuum is a heuristic device to enable a teacher to think about what medium or technology will be most appropriate within any given context, and not a firm analysis of where different types of educational media or technology belong on the continuum. Thus where a medium or technology ‘fits’ best on a continuum of broadcast vs communicative is one factor to be considered when making decisions about media or technology for teaching and learning. Activity 6.4 Broadcast or communicative? 1. Determine which is a medium and which a technology, or which could be both, and under what conditions. 2. Decide where, from your experience, each medium or technology should be placed on Figure 6.4.3. Write down why. 3. Which were easy to categorize and which difficult? 4. How useful is this continuum in making decisions about which medium or technology to use in your teaching? What would help you to decide? If you want to share your responses with me and other readers, thus turning this post from a broadcast to a communication, please do so by using the comment box below! My analysis can be accessed by clicking here. 6.4 Broadcast vs communicative media by Anthony William (Tony) Bates is licensed under a Creative Commons Attribution-NonCommercial 4.0 International License, except where otherwise noted.